Hosting a party can be both a stressful and fun activity to do but one of the most important aspects of having a party is to have ways to keep your guests entertained. One of the most effective ways to keep your guests entertained and to get people to mingle is to have plenty of party games at the party. Here at Garden Games, we have plenty of games that are suitable for both indoors & outdoors which would be perfect for any party, check them out below. The Garden 4 in a Row set is a bigger sized connect4 game which is suitable for playing indoors and outdoors. this makes this game perfect for indoor and outdoor house parties as well as bbq parties. It is also a great game for both children and adults which makes it suitable for all kinds of parties and events. A game of skill and tactics, throw the giant dice and it gives you a choice of 2 colours .Choose one and remove a brick of that colour from the tower. Get it right and the tower stays tall get it wrong and the tower will fall. Everyone screams JAMANGA! By using your skill and nerve you can leave the tower on the edge of collapsong making it impossible for your opponent to leave it standing. This is a brilliant game for laughs, fun and to get the party started. A giant game of skill and strategy, the aim is simple try and remove the sticks without the balls falling. The player with the least balls at the end is the winner. Can be played indoors or out measuring 45cm x 40cm. Its a great game for all ages. Japlonk is a perfect party game. What better way to entertain your guests than to create your own makeshift table tennis table in your own home. All you would need is a table or a worktop and something to divide the table in two to act as a net. 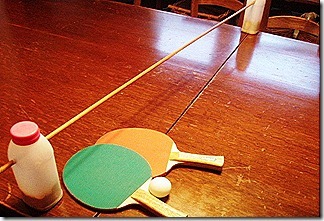 Our Table Tennis set would cover everything else as it includes 2 high quality paddles and 3 ping pong balls.